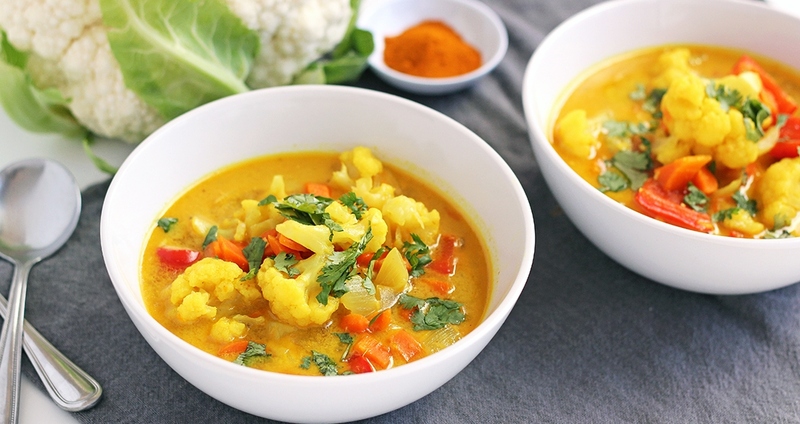 This cauliflower soup is a wonderful way to warm up your body and calm inflammation. Ginger, turmeric and a touch of cayenne pepper add a nice bit of spice, while coconut milk makes this soup deliciously creamy. To make this soup heartier, try adding 1 cup of cooked chickpeas or your protein source of choice. Add coconut oil to a medium pot over medium heat. Add the onion, carrots, garlic and ginger and sauté for 5 minutes, until onions are translucent and vegetables are aromatic. Add the cauliflower, bell pepper, turmeric, cumin, cayenne pepper, salt, coconut milk and broth, and bring to a boil. Lower heat and simmer, covered, for 15 minutes, or until cauliflower is tender. Season with black pepper to taste and serve hot.